I love when summer gets its heat inside the bricks of the house, and the butter in the dish on the counter gets so soft round the clock you have to hold the blade of your butter knife horizontal during the brief airlift to the slice of toast. I keep a short list of priorities tacked to my wall, and this summer the top of the list reads, “The computer is for writing, outdoors for thinking.” It’s a dual reminder. One, don’t waste time watching cat and goat videos – not too much anyway. Two, if you’re spacing out instead of getting words on a page, don’t waste time staring at an idle screen, go outside and think about it. I have always gotten more accomplished during summer than winter, even though it’s filled with so many more distractions, the sun being number one. It could just be a matter of the sense that you need less sleep. In summer, give me six hours, and I’m a tiger. Come October, I crave the full eight. 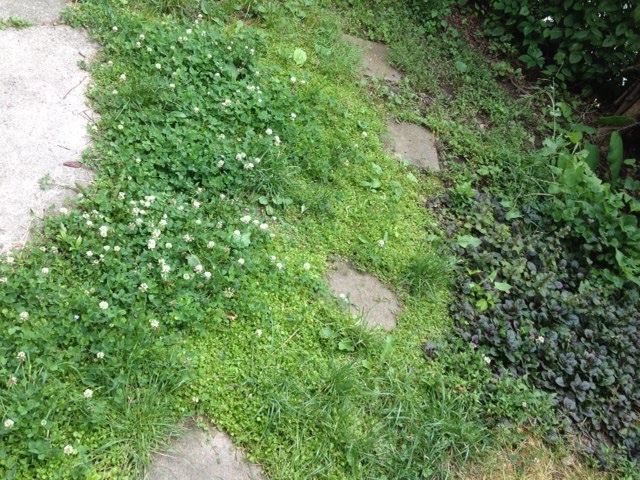 The mazus reptans (center) and the ajuga (right) were by design, the clover (left) a concession. I wrote last summer about my affection for common garden weeds, which is only getting deeper now that they’ve turned me. There’s so much shade in our tiny urban plot, it’s hard to grow grass. Other plants want to grow there, and I’ve started letting them have their respective preserves. Clover has three generous patches, one over the grave of a dear, departed wild cat named Merv, whom I buried back in April. Anything else that tries to get inside the clover patch, I pull. Moss gets the shadiest region along the back fence – though I’m finding it hard to pull other weeds out without pulling up a divot of moss, even when it’s soaking wet. Ladies thumbs have their autonomous regions. Even the ugly wild plantain gets a patch, where no dandelion is allowed. My wife is a master gardener, at planting things. I am the master of taking things away – removing what I don’t want there – and the results are shaping up. It occurred to me while pulling weeds that summer gardening is like summer writing. Most writers I know, good and bad, are full of ideas. Fecund with them. Lousy with them. Brimming with them. “Wouldn’t it be great if…” “Imagine if…” They just come up with lots of stories or metaphors. It’s magic, giving to airy nothing a local habitation and a name. The hard part is making any sense of it. Knowing when to take away. I’ve read most of the major books about screenwriting, and most of them pay some lip service to the Rosetta Stone of all writing guides, The Art of Dramatic Writing by Lajos Egri. Egri was a playwright who taught that a play must be about a thesis, and that thesis gets proven by a dichotomous pair of characters. It’s tough love from a Hungarian grandpa to all dreamy-eyed writers: Don’t just throw ideas on a page, start with a premise. You can see, when you watch a play from when Egri’s teaching was most widely accepted – a Tennessee Williams or a William Inge, for example – just how powerful this kind of writing can be. If only it came so naturally. Writing, I find, is more like weeding. Your brain is a fertile patch of dirt. Stuff is going to sprout out of it. If it doesn’t, maybe you shouldn’t be a writer. The trick is to collect it on a page and then try to make sense of it. If I’ve learned anything from my garden, it’s that to make anything beautiful, you have to keep pulling – and don’t hesitate to yank out giant handfuls, because this stuff will indeed keep growing back.